The original 8-bit parallel port was developed by IBM in 1981 as a faster interface to dot matrix printers than the then standard one-bit serial port. The parallel port greatly increases transfer speeds by using an eight-wire connector that transmits the eight bits in a byte of data simultaneously, thus sending an entire byte of data in the time it takes to send a single bit in a serial system. This byte of data is supplemented by several other handshaking signals, each sent on its own wire, to ensure that data transfer takes place smoothly. The major drawback to the original parallel port or Standard Parallel Port (SPP) was that it allowed for communication in only one direction – computer to printer. While there were wires which the printer could use to indicate its status to the computer, it could do no more than put a positive or negative charge on these wires. (See the table below for a comparison of parallel protocols.) This arrangement effectively limited the parallel port’s potential and precluded it from being used in bi-directional communication such as is required for external storage devices. IBM soon realized the advantages to be gained from enabling the parallel port for bi-directional communication. While early bi-directional efforts did indeed provide for two way transfer, they did little to make the parallel port a viable alternative for high speed data transfer. To address this problem, a new standard for parallel communications, known as IEEE 1284 (for the committee which established it) was approved in 1994. This standard sought to correct the major drawbacks to the original parallel port structure. The first major drawback was that not all parallel peripherals used the same mechanical interface and, thus, the maximum cable distance between computer and peripheral could only extend 1.8 meters (6 ft). IEEE 1284 set standards for the cable, connector and electrical interface to guarantee interoperability between all parallel peripherals. The specified configuration ensures that data integrity is maintained, even at the highest data rates, at a distance of up to 9 meters (30 ft). 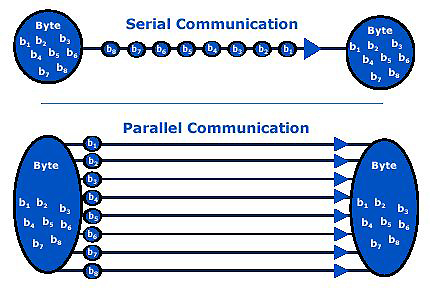 IEEE 1284 also set design standards for true bi-directional communication between devices. However, the real advance came with the Enhanced Parallel Port (EPP) protocol. EPP utilizes data cycles that not only enable bi-directional communication, but also provide for real-time data transfers by permitting intermixing of block transfers, read operations and write operations. The EPP specification also solves the speed problem. Parallel data transfer was largely performed by software in SPP systems and, thus, data transfer rates were limited to 150 kbps. The new EPP standard specified a hardware driven handshake system of data transfer that allows significantly higher transfer speeds – up to 2 Mbps. In EPP mode, data transfer takes place as a single software instruction and the rest of the transfer is handled by hardware. This allows an EPP port to function as a 16-bit or 32-bit data transfer interface using 8-bit I/O hardware, in effect, enabling EPP peripherals to achieve the same speed and efficiency as their ISA bus counterparts.